As evidenced by the popularity of the Knitting & Gin pin, knitters like their adult beverages. 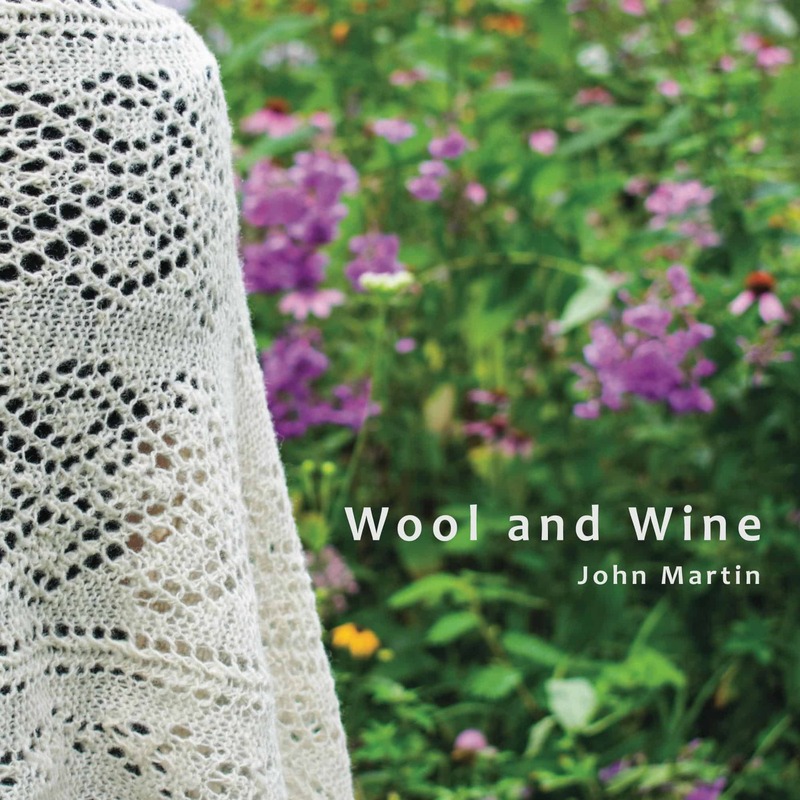 Massachusetts resident John Martin took the idea a step further with his new book, Wool and Wine (affiliate link). John, who developed an appreciation of yarn and knitting from his wife, Melissa, came up with the idea for a book about yarn and wine during a project management course. Though he didn’t actually have to publish the book to pass the class, he decided to go forward with the project anyway. 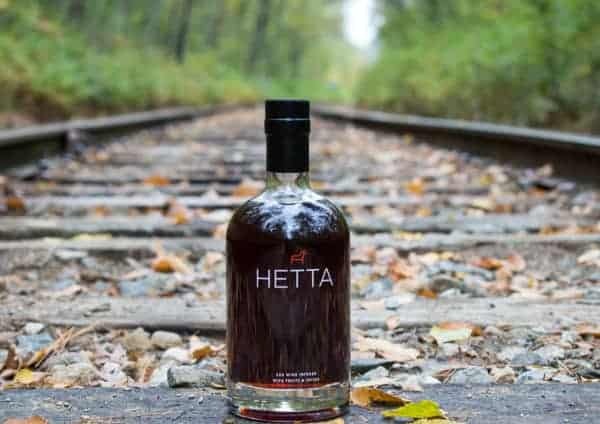 In his self-published book, John expertly weaves the stories behind a dozen indie dyers and yarn companies, including Indie Untangled regulars Eden Cottage Yarns, The Woolen Rabbit and Cedar Hill Farm Company, together with those of their vineyard “pairings,” such as the Rhinebeck favorite Hetta Glögg. 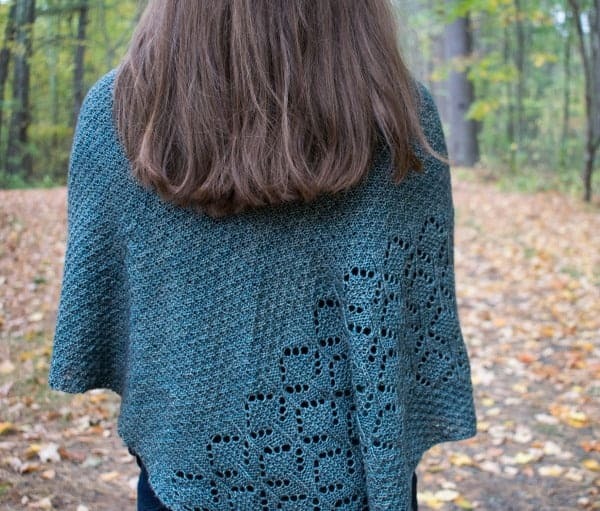 There are also suggested patterns for the yarns, with samples knit by Melissa and photographed out in nature (the patterns themselves are not included in the book, but you can purchase them on Ravelry). The book actually began as a project for graduate school. I was taking a project management class and needed to come up with a “project” to work on. I had always been interested in writing a book and on a whim, I suggested that as a possible option to the professor. She approved the idea and I was on my way! As part of the course, I was required to come up with a subject for the book, budget, market research, timetable and many other related tasks. My final assignment was a presentation detailing the project from start to finish and when I was done, the professor said to sounded like a great idea and to let her know if I ever actually wrote the book. I had the market research showing that there was interest in the idea so after giving it some additional though, I decided to give it a try. I figured that even if it didn’t work out, it would be a fun project to work on with my wife and daughter. I am not sure how other books are written by in my case, I had a very detailed, step-by-step plan! As I started each new step, I would think, “Will I be able to get everything done or will this be the step that I get stuck on?” Gradually, one step turned into the next. There is a Christmas special called “Santa Claus is Comin’ to Town” which has a song called “Put One Foot in Front of the Other” – I am always reminded of that as I think about the process that I went through! After about a year of tiny steps, I had Wool and Wine. Wine from Dry Creek Vineyards and yarn from The Woolen Rabbit. How did you come up with the dyer and vineyard pairings? I notice that each are from different parts of the world. Initially, I thought that the pairings might be one of the harder parts of creating the book. The dyers/yarns and vineyards/wines were actually chosen independently and to some degree based on a particular individual actually wanting to participate in the project. I started with an idea that I wanted to include a wide variety of wines and yarns – things that perhaps folks were not as familiar with; a spiced wine for example or a relatively new dyer – to make the book more interesting. However, just reaching out to someone did not guarantee that they would want to be in the book so it was impossible to try to plan the pairings ahead of time. Ultimately, we ended up with a group of wines and yarns that may or may not have something in common. The big fear was – what if I am not able to find a good pairing for one of them? As it turned out, the pairings just seemed to develop by themselves based on a wide variety of criteria. In the case of Long Ridge Farm and Poocham Hill Winery, they are located within a mile of each other in New Hampshire and are run by college friends, so they obviously needed to be together. Some of the yarns were very elegant and sophisticated and seemed to go best with a rich, refined red wine. Some yarns were light, bright and fun and were paired with sunny, summery rosés and white wines. In the case of the glögg, which is a Nordic spiced wine, it has a long history of being served in cold weather and what better yarn to work with in the winter than a soft, buttery, bulky (Hedgehog fibres in the case of the book). In the end, everything just seemed to have a natural match! It was fun to talk about the pairings at the beginning of each section and provide the reader with the reasons why the pairing was created – I really had a picture in my head of the wine being drunk while someone knit or wore a piece made with the yarn. A good example is the chapter featuring a beautiful yarn from Kim Kaslow (The Woolen Rabbit) and a nice zinfandel from Dry Creek Vineyard. 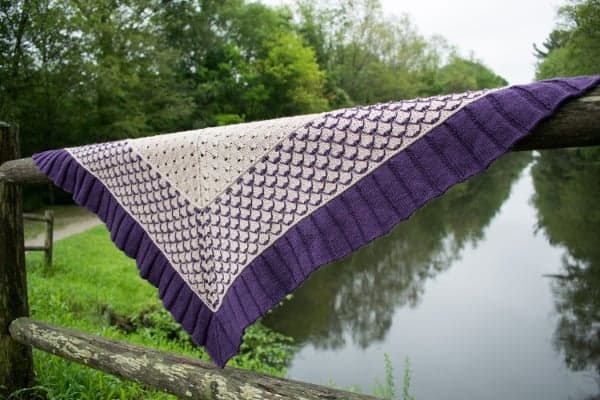 The color inspiration for the yarn was the 1940s and I can really picture a starlet wearing a shawl made from the yarn (a design from Paulina Popiolek is highlight in the chapter), at an elegant black tie gathering with a glass of zinfandel in her hand. Did you visit any of the wineries? I wish that I had been able to visit them all! Poocham Hill Winery is relatively close to my house and I was pleased to be able to spend some time with Steve Robbins and Mame ODette, learning about their history and operation. Many of the other wineries were generous enough to provide me with time on the phone so that I could conduct my interviews remotely. The first wine tasting that I ever went on with my wife was to Dry Creek Vineyard in California. Until that time, I selected wine based on cost more than anything else, so I was not sure what to expect when we arrived! The staff there were extremely generous with their time and talked about the differences in the types of wine, how they were aged and what types of food to pair them with. It really opened up a whole new world for me. I remember later in the day wondering how people established vineyards and opened wineries. When I started working on this project, one of the first wineries I reached out to was Dry Creek and was thrilled when they agreed to take part in Wool and Wine. What was the publishing process like? I have been involved in writing, editing, photoshoots, printing and layouts for a number of years professionally but never with publishing. Honestly, it was a bit daunting at first – saying “I want to write a book” is a lot easier than actually doing it! Because of my background, the creation of the content was fairly straightforward. While I was interviewing, writing, photographing and editing, I started researching how exactly to take all of that information and make it into a book. In my case, I wanted to self-publish, so there was a lot of research done on the exact process. Luckily, there is a lot of good information available to educate yourself! There was a very surreal point where after almost a year of work, I just needed to press a button and the book would actually be published and available for sale! I remember thinking that there must be more to it than that! Some type of fanfare or something! But no, in the end, it just came done to a simple click of a button. That is not the end of the process of course. Once you have a book and folks can purchase it, you need to let everyone know that it is out there. The marketing and promotion can be a bit of roller coaster – big sales followed by very few purchases – but I have been working for a number of years as a marketer so I am a bit more comfortable with that aspect of the work. What is your professional background and how do you think it informed your book? If you look at my background, I doubt that you would connect it to a book or at least not to a book about wool and wine! My undergraduate degree is in Biology and my focus was on Environmental Science and Ecology. I am still working on my graduate degree part-time (one and a half classed left!) and that work is in Business, specifically Organizational Leadership. Professionally, I have worked for a number of scientific instrumentation companies and am currently a regional marketing manager for a company that manufactures weather detection equipment (like the weather radars you see on the television news). So, from that perspective, I might well be writing a book on a scientific subject of some sort. However, if you look beyond the obvious, a lot of the skills that I have picked up along the way have been helpful with the project. I have done a lot of writing for industry publications as well as creating technical papers, brochures, websites, etc. – activities that have helped me to learn how to communicate with people using a lot of different types of media. Photography and photoshoots have always been part of my job, as has the creation of graphics, designing and editing. All of those different things have played a part in helping me not only visualize and create Wool and Wine but also in its promotion and sale. My specific interest in yarn and knitting stems from spending a lot of time next to my wife on the couch as she created beautiful things (and my wearing many of them!) – I caught the knitting bug from her. I always found the entire process fascinating – self-stripping yarn is amazing! – and wondered how people got their starts. Very similar to that first day wine tasting when I starting wondering about the people behind the scenes. That is really what the book is focused on – the people behind these wonderful products – how they got their start, what inspires them and where they want to go in the future. The history behind knitting and its profound effect on people are also fascinating and I enjoyed weaving that into the stories as well. Tell me about your knitting story. One of the things that I will always remember about my grandmother was her knitting and crocheting. She always had one project or another going and she was really the only knitter I remember seeing when I was young. When the weather got cold, she would focus on making slippers for everyone in the family – taking requests for colors, pom-poms, reinforced heels and just about anything else you could want. I do not ever recall a time when I did not have a pair under my bed. She would also make blankets for each family member when they became engaged so that they would have one handmade item to start their new life with – I still have the one that she made for my wife and me. Knitting faded from my life as I got older. It did not return until after I was married and I can attribute its comeback to my love of baseball. Or rather, my wife’s indifference to the sport. As I would settle down to watch a game she quickly started to look for something to occupy her time while she kept me company. She started to teach herself knitting and gradually became more and more proficient. My contribution at first was strictly as a model but I soon started to see yarns that I never had encountered in my grandmother’s knitting basket. 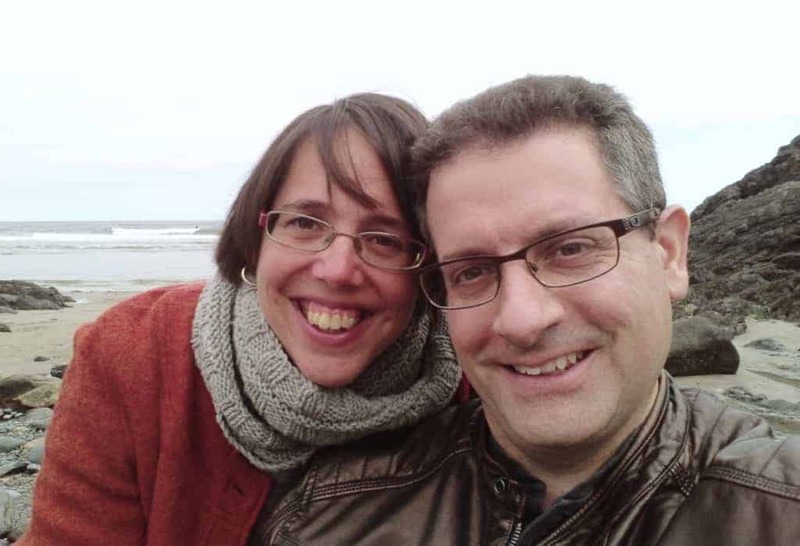 I began to accompany her on trips to fairs and yarn events and to poke around yarn shops (our first Sheep and Wool Festival in Rhinebeck, NY together was in 2008!). The excitement and passion of the knitting community really is contagious and soon I was looking over her shoulder at podcasts and flipping through books. It was just a short hop from there to making my first tentative attempts at a washcloth! What kinds of projects are you usually working on? My knitting skills are still in their infancy – the majority of the knitting for Wool and Wine was carried out by my wife. However, I am lucky to have such a skilled knitter in the house for teaching, tips and corrections (probably more corrections than anything else!). I am currently finishing off a hat and this summer, after my current graduate class is completed, I would like to move on to socks, which are a natural progression in my learning. I am hopeful that I will be able to progress to the point that I will not be yelled at for knitting too tightly! What is your favorite wine and favorite yarn to work with? My favorite wine really depends on what I am eating but I favor Malbecs if they are available (especially from Argentina and Chile). I also like a nice, chilled white during the summer. I have been fortunate enough to do a lot of traveling over my career and have enjoyed trying regional wines in many parts of the world. You can find a good wine just about any place if you take the time to look. I wanted to highlight that in the book as well and was lucky enough to be able to include some wines from non-traditional locations such as Maine, Wisconsin, New Hampshire and Texas. One piece of advice that I was once given was to find a wine that you enjoy and drink it – it does not matter how much it costs, where it comes from or what others think of it. If you like it and are happy enjoying it, then it is a good wine. Regarding yarn, I am drawn to natural colorways – likely because those are colors that I would tend to wear myself (although I do occasionally sport some pretty crazy sock colors!) – and most definitely hand-dyed indie yarns. I really admire the entire dying process and how complex it can become; it is a true art form. A yarn that has a very deep palette with multiple layers of color definitely catches my attention. With so many innovative technique and unique colors, there is always something new to discover in the world of yarn, which contributes to its uniqueness and excitement. Something that I came to admire during my research for the book was the organic wools and production techniques that are starting to become more popular and I hope to be able to learn more about that in the future (thanks to Rosy Stegmann and Patrick Grubaen of Rosy Green Wool for getting me started!). John was generous enough to donate a copy of Wool and Wine for a giveaway! To enter, comment on this post with your favorite type of wine and/or vineyard. The giveaway will run through midnight EDT on Wednesday, May 2. A winner will be chosen via random number generator. This giveaway is now closed. Congrats to winner Annie! This entry was posted in Q&A. My favorite wine is a nice dry, fruity Pinot Grigio! My favorite wine is a Shiraz. My advice to John (from a sock teacher and sock designer) is there is no such thing as too tight when it comes to socks. The tighter the knit, the more comfortable the sock. 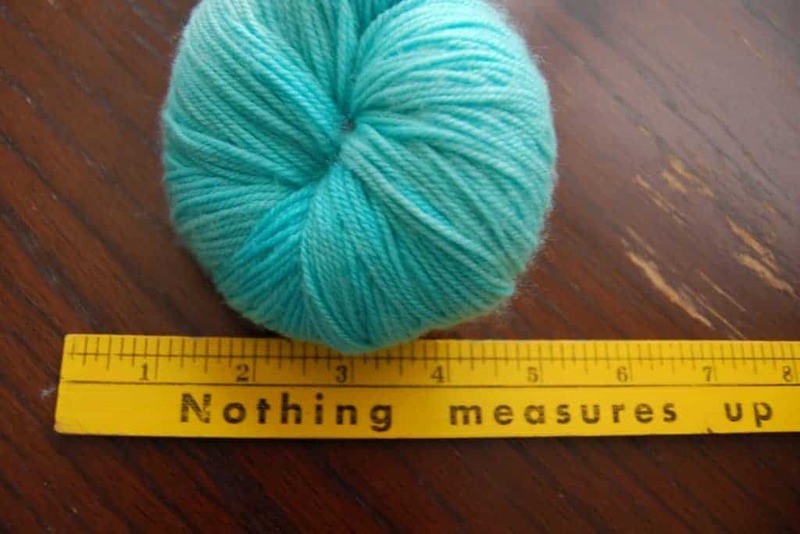 He may have to go up a needle size as I do, but the end result is lovely. I am also a project manager/PMP and appreciate the work he put into this and applaud him. I like a nice (red) Cote du Rhone. The first time I had a glass was at the home of a friend who has quite an extensive, well researched (and sampled) collection. Afterwards I bought a bottle for my husband and I. Then I went to get another but that vintage was not in stock. I purchased the same wine/different year instead, but didn’t like it as much. Which taught me the following lesson: if you like it, buy a case, because when it’s gone it’s gone! Really enjoyed this article and would love to read the book! My favorite wine is a reisling from Chateau Ste Michelle Winery in Washington. Must find the book. I love a cold glass of rosé in the summer. What a fascinating article! I enjoy many different varieties of wine, but my current favorite is a Dry Riesling from Wolff Vineyards in the Edna Valley near San Luis Obispo, California. We just returned from a road trip to California, and the tasting we did at Wolff was a highlight of the trip. 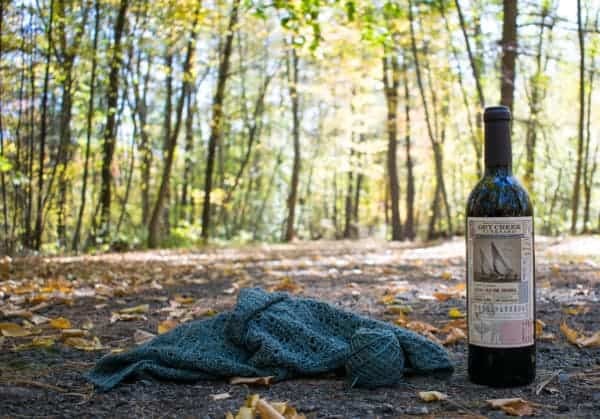 My favorite vineyard is local- Lost Acres Vineyard in North Granby, CT. They make two great Reislings, my favorite wine, in a dry and a sweet. This is such an interesting idea! My preferred wine changes with the seasons. In the winter I prefer reds, usually a Cotes du Rhône. In the summer bring on the rose. And it is always a good time for bubbles!